The App Economy is tricky business. How can you tell how sticky an app is? By heading to the app store and taking a look at install volume and store rank? These are easily manipulated vanity metrics, and they only give part of the picture. So what happens to an app after an install? The new standard of app valuation measures actual user behavior – like usage patterns, in store and external traffic sources, user interests and more – to give a clearer picture of how successful an app is at keeping users engaged. 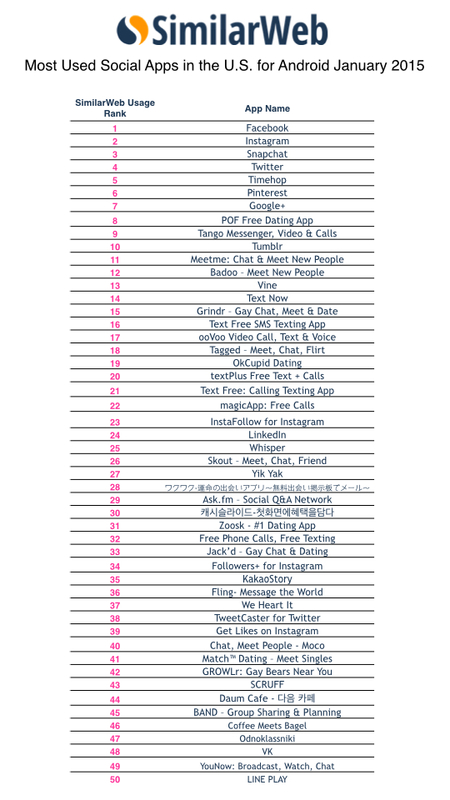 Based on these metrics, we’ve come up with this list for the top 100 most used social apps in the US for Android in January 2015. Since our data is based on engagement metrics, you might say that these are the most addictive apps in the US. The omnipotent Facebook dominates at number 1. By far the most popular social app, it’s place as the top used app reflects just how strong the app is; It’s also the number 1 most used social app in most countries and the top used app in the world for all categories. Instagram comes in close at number 2, with Snapchat and Twitter falling in at numbers 3 and 4, respectively. Perhaps it’s no surprise that Facebook, Instagram and Twitter are the most used social apps, as these are established brands and are well-known social apps. Snapchat, on the other hand, is quite the little social climber. The picture-based social messaging app is only three years old and is already quickly ascending the ranks of dominating the social app economy, with recent figures putting the market value of the company between $10-19B. The launch of its Snapchat Discover feature – which allows users to see “stories” from different editorial groups – has given it an even bigger boost in popularity. Of course, it’s not just popularity we’re talking about here. As the list demonstrates, this app is “well-liked” (and by that we mean, used often). And with millennials snapping up this hot little photo-based social app, there’s no telling how far this app will go….the (virtual) sky’s the limit. Another surprise, the social “nostalgia” app Timehop ranks in at number 5, nosing ahead of Pinterest, Google+ and Tumblr. Perhaps users are feeling wistful for yesteryear, which could be why this time-capsule app is amongst the top five most used social apps in America. Aside from Twitter, the rest of the top 5 most used social apps are heavily image based. A picture, in this case, is clearly worth a thousand words… or perhaps more accurately, a thousand shares. The rest of the list is a mix between lesser-known social apps and plenty of dating apps. 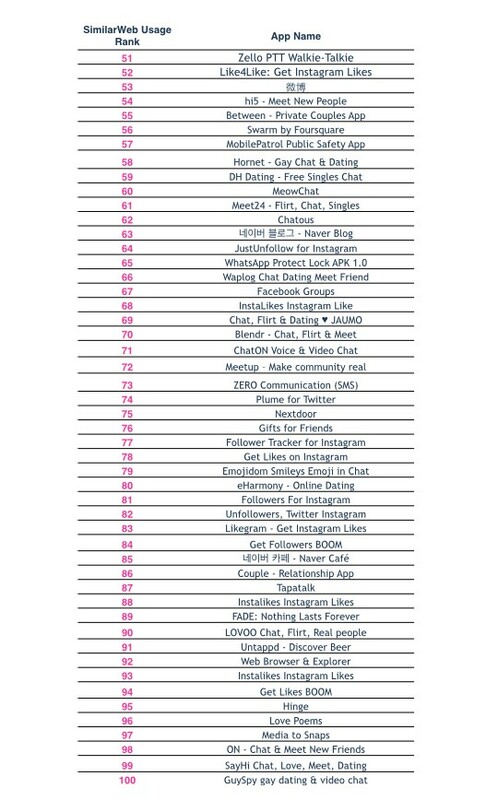 Instagram’s popularity as the number 2 most used social app in the US is obvious from looking elsewhere on the list, as 13 out of the 100 most used social apps are Instagram-related. For the moment, it seems image-based social media and dating apps rule the roost. Competitors would do well to model their apps after these wildly successful most used social apps. Designers, too, can benefit from this bit of data, by checking out the UI of apps that have the highest usage rank. After all, apps that get used often after install are clearly keeping users interested, and it’s likely that UI – and UX – have an important role in boosting user engagement. Publishers can also use this list to find apps that are worth their while in terms of advertising. It can also help those with similar apps discover how successfully the competition is at keeping users engaged. So while we’re talking about engagement, keep your eyes on Snapchat – that’s one social media app that has everyone captivated, which makes it a prime app to learn from. This post is part of the 'Market Intelligence' series, brought to you by SimilarWeb: get insights for any website or app.